One of the most frequent comments you’ll hear from the anti-MMR groups is the progress they are making in the States. They will link to the completely irrelevant case of Hannah Poling, and then reference the enormous case going through a special court in Washington, where 4800 families are attempting to sue for compensation after their children developed autism, which they believe was linked to the MMR vaccination. That will come to an end, since the court has ruled against the first group of the families, making it clear that there’s no supporting evidence for the claims whatsoever. Of course, while this is a victory for scientific rationale and common sense, it’s not a time to celebrate. It means that 4800 families seeking compensation to help them raise their autistic children have had their time wasted and their hopes dashed by these vile and malevolent campaigners, lawyers and quacks. The people who have lost are innocent victims of the lies spread by Wakefield and his band of useful idiots. I’m very sorry for all my moaning. Thank you for the first snowfall I’ve seen in my adult life. Being a snow lover, being someone who finds their mood immediately uplifted at the sight of a thick layer of white fluff on every branch, and the landscape transformed, there is nothing more mindless and cruel than telling me that amazing amounts of snow are forecast. “It’s going to snow tonight, a few inches!” “No, it won’t,” I said angrily to all these evil liars. And no, it bloody well didn’t. Switching on the news this morning is like receiving a phone call from a friend who’s at the party with simply everyone, while you’re at home on your own with nothing to do, and no invite. Schools closed, trains in disarray, killer snowmen destroying cities – I’m SO happy for you all. Bursting with it. Screw you, sky. You know what? I’m glad about your stupid ozone hole. I hate you. Twitter annoyed me. I’m not sure why. I think it’s something about the unimportance of the minutiae of people’s lives, and the over-abundance of communication. And then I realised I like Facebook Status Updates, and then that was that. Right, I realise I’ve barely any readers these days, and I realise last thing on Friday is a stupid time to do this, but I need to know. 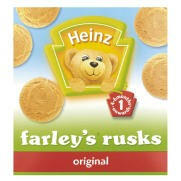 Most Brits will remember Farley’s Rusks. The biscuits designed for teething babies, aged 4-6 months and older. I’m sure there are equivalents in other parts of the world. Full of calcium and iron, they’re brilliant for babies with their crunchy start, and quick dissolve into mush in the mouth. They’re clearly designed with babies and toddlers in mind. However, I note on the box that there’s no upper age limit. So is milk. And no, not breast milk. Cow milk. At around six months, when you can start giving a baby Rusks, you can give them regular milk. It contains many nutrients babies need! Does that mean it’s exclusively for babies? NO! You’d have to be a colossal idiot to make such an argument. Therefore, please, can Rusk accepting people out there please let others know they’re delicious and nutritious. There’s a reason it says “for all ages” on the box, people. I hereby begin the campaign for Rusk-eating adults to loudly and proudly declare these enormously flavourful treats as their own! As people I know start to have babies, I’ve realised that in amongst the tens of thousands of books that tell you their right way to raise a child, there’s room for one more. It’s called, “Tips For Raising Your Child (That Might Kill Them)”. It’s admittedly a controversial approach, but it’s bold and original. Parents have the crap scared out of them every other fifteen seconds. One book will proclaim if you give your five month old a piece of banana before their fifth month and second week they will definitely die by catching on fire. Then the next says that failure to provide banana by this point ensures they’ll die of meningitis. Your baby doesn’t sleep through the night by 13 months? You’re the worst parent ever and you’re going to prison for ever. Your baby does sleep through the night by 13 months? Your baby has Sleep Cancer and will be dead by the morning, you murderer. With so much certain doom prophesied upon you by these morbid soothsayers every day, I think there’s certainly room for the baby raising book where there is a risk for the child. For instance: Your baby cries too much at night, and you’re not sleeping, and nothing will soothe it? Increase the levels of carbon monoxide in the room. It will help the baby sleep, but it might kill it a bit too. Worried about diseases? Babies need to build up an immune system to prevent them from getting sick when they’re older. So instead of food, feed your child a variety of poisons, allergens and dirt. If they survive, they’ll be near immortal. Concerned your child may have latent super-powers that aren’t being realised by traditional baby-raising advice? We all know babies can instinctively swim, but later lose the ability if not taught. The same is true for all manner of paranormal powers. To check for most of these before those instincts are lost, throw it out an upstairs window. Despite this, during the last week I’ve been left alone for the odd hour with an eighteen-month-old girl, which is far less terrifying than I’d thought. I’d assumed it would be the cute little girl screaming in misery at being left with the hairy big man, him sitting there helplessly, surrounded by bleeping toys and puddles of tears. Turns out such brief babysitting is mostly about going through wooden books with colourful pictures of cows and apples, stacking boxes into short-lived towers, and watching Yo Gabba Gabba on Tivo. Oh, Yo Gabba Gabba – it is by far the best thing in pre-school TV since Sesame Street. I will be writing more about Yo Gabba Gabba for sure. After my successful trip to the fantastic 826NYC, I went into a shoe store to get something new to put on my leg-hands. I decided I wanted some Converse boots, because it’s been a while. The store was just astonishingly loud. I’ve been in noisy music shops, but never have I been anywhere outside of a club or live music venue at this volume. In fact, I’d likely leave a club or live music venue that felt the need to have the sound quite so obnoxiously loud. This isn’t the exaggerated grumbling of an ageing man – it was, beyond belief, insanely loud. I literally had to shout at the top of my voice to the sales assistant to ask for some boots to try on, repeating myself three times before she heard what size. She went into a back room to look for them. While I waited I watched the very many staff in the place enjoying the music. It was, extraordinarily, a sort of UK garage-meets-rasta remix of the Scooby-Doo theme, which clumsily stumbled its way into the Sesame Street theme, all decorated with enthusiastic shouting. All at a volume far beyond that which the in-store speakers were equipped to handle. So it wasn’t only loud, but also fizzing and popping in pain. The staff seemed very pleased with it, with one girl doing some excellent dancing to entertain all within. After a while another staff member asked if I was being served. I boomed my explanation that a while back someone had gone into this back room looking, and I was beginning to worry about her. She followed her in. And also vanished. Were they dead? Or simply letting their ear drums have a moment of respite? After far too long in this nonsensically noisy place – like some kind of mad nursery for horrendous pre-schoolers – I was give the brown Converse boots I’d asked for, and made my getaway. Having realised that, oh no, doesn’t David Tennant’s Doctor Who wear brown Converse? Am I unconsciously attempting to dress myself as a mutant version of various Time Lords? The answer to this is clearly, and deeply troublingly, yes. And I think the long-coated, longer-scarfed, grey-stripey-cotton-hatted, brown-shoed, hair-faced figure I now cut in public should strike fear into the hearts of space monsters and naughty robots everywhere. And indeed anyone else who walks past. In America! Hooray. I thought I’d find out what all the fuss was about, having heard rumours of a country where the locals all drive cars and the root beer comes in glasses. It’s all true! I’m over in Philadelphia (or near enough) for a while, visiting Kim and Nick. But today I’m in New York, currently in a Starbucks filling half an hour before I get on a subway down to Brooklyn to try and find 826NYC and the Superhero Supply Store. This is how cold New York is: All the cold. It’s so cold that my beard froze. Emerging from Penn Station, condensation in my hairy face from the temperature change, I wiped it to hear cracking sounds. I am fairly certain this means my impending death as soon as I venture from the warmth of this narrow coffee hole. It’s the sort of cold where you’re whole face hurts and you wonder if you’ll be able to do expressions again. The sort of cold where people exchange looks of pain as they walk past each other. I love it. To celebrate I went into Macy’s to buy a scarf. Even though the British Pound’s tombstoning jump into half an inch of lava and spikes means the US is no longer half-price, it’s still a far more reasonably priced nation, and it’s always worth getting as much stuff here as you can squeeze into your bag. Macy’s isn’t exactly a place for bargains, but anything in a sale is going to be less than half the cost in the UK still. However, the same rule doesn’t appear to apply to scarves. Average price: $50. All because they’ve got some stupid logo or other printed on them, in some remote corner. I don’t need to spend £30+ on anything, let alone a long thin bit of wool. However, between these stands of massively overpriced piles of knitting were racks of $25 scarves, which would seem just about reasonable until you see how long they are. The man at the counter asked me if it was two or three I’d picked up. It was one. This scarf is long enough for two people to share, without needing to be in the same town. It’s so long it’s almost impossible to wear. And it’s entirely impossible to wear without looking like a reject from the Doctor Who auditions. Which fortunately is the look I’m consistently striving for. “What do you mean you don’t want a fat, hairy Doctor? TO HELL WITH YOU ALL!” And then with a swish off my scarf over my shoulder, and the resulting deaths of three passers-by, I storm off. And that’s all the scarf news.